I'm doing a little private swap with Jessie and I came up with this idea for her table topper. I used all the pretty new prints from Tula Pink's Birds & Bees line. It's pretty simple in construction, but I went all out for the quilting! I've been wanting to expand my free motion quilting repertoire and I love this cathedral window look. I've seen a few similar styles, but I always found the method difficult--I couldn't see the corner I was aiming for while I was quilting. I'm going to be posting a video tutorial soon about how I did this. It was so incredibly easy (and forgiving!) I'm already excited to try it out on another quilt because, as we all know, practice makes perfect with FMQ! UPDATE: Here is the video tutorial! It's also posted on my YouTube channel, kelbysews. How funny, I just got the above book out of the library today! alright your tutorial has inspired me to try this, may need to be on something smaller to give it a whirl. So appreciate you posting this video, makes it so much easier to understand. Great tutorial. Finally something I can understand!!!! Thanks so much for this! 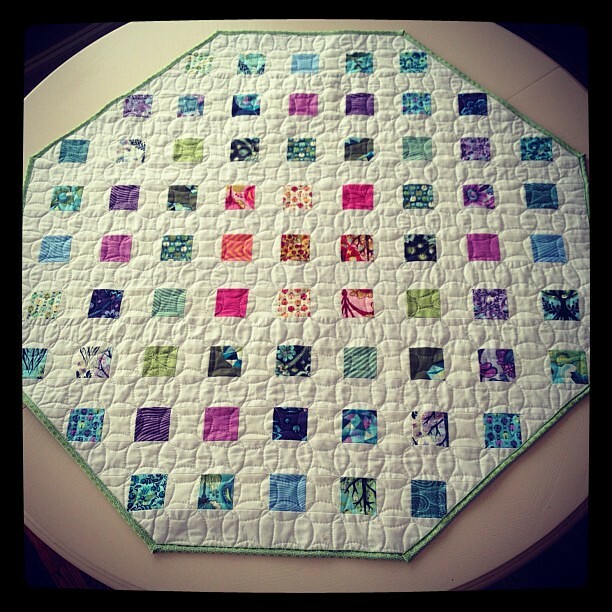 I love this quilting design and this seems much more do-able than other methods I've seen. What a great look. Love the quilting. Thanks for the tute. I saw this on Flickr and just loved it. Sooo beautiful! great tute! I tried to 'pin' it, but it said 'cannot pin this image' :( Is your picture storage set on private? What a great tutorial! I've tried this type of quilting before, but found it really hard to get it looking good. This looks like I might just manage it. I've got a charity quilt to quilt and I think I might just give it a go. Thankyou! Thanks for sharing this video - was the shove I needed to give it a try! I love your quilts - I've been inspired to try (again) paper piecing, and I like seeing your (some) simple designs that really make a statement. I'm realizing that quilts don't have to take years to complete! Made using your paper piecing pattern. I absolutely love this! 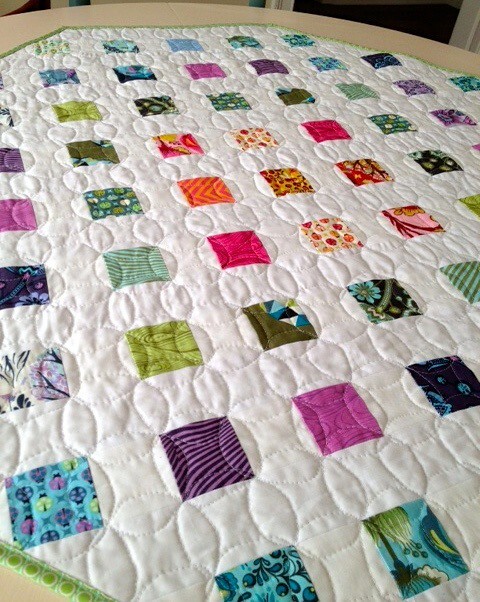 The placement of color in the quilt looks fab, and that quilting is brilliant! Thanks for the tutorial - love the quilt. oh i love the quilting on this!its really lovely.. i bought angela's book too. I just received it today and am so excited to start like what you did with that quilt you just finished quilting...great job. Hee hee, it's cool to hear your voice! And it's funny, I would never have thought of doing FMQ horizontally/sideways/you know what I mean. Thanks! I'm definitely gonna try it next time.